The Music in Me series consists of the Music in Me child’s book and Activity Book and More Music in Me child’s book and Activity Book. This program is offered in two 18 week semesters, 45 minutes weekly. 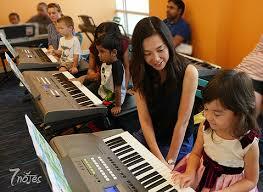 The curriculum is designed to immerse children and parents in activities which develop the ear, utilize the tactile-kinesthetic sense, explore keyboard geography and playing through tracking activities, set pre-reading concepts combined with pitch awareness, experience large motor skills in movement songs and finer motor skills with hand/finger play songs and activities. Singing (words and solfege) for pitch recognition, for solfege ear training, to set pitch direction and sequence on the keyboard, to experience question/answer activities, to develop a feeling for dynamics, expressiveness, and phrasing, and just for fun! Movement – both free and guided to recognize and experience meters, moods, tempos, and styles. Rhythm activities to develop a feeling for pulse through body rhythms and use of small percussion instruments. Students experience and feel a variety of note and rest durations and rhythmic patterns. Keyboard/Piano activities are designed to strengthen pitch concepts and explore the geography of the whole keyboard. Children touch and track pitch patterns as they sing – providing a strong tactile connection between the fingers, the voice singing and the keys. Finger Readiness – enjoyable finger play songs prepare a “soft” handshape and awareness of finger numbers as they relate to pitching patterning. Creative Activities and Projects – children and parents are encouraged to do creative projects at home which reinforce pre-reading pitch activities that have been experienced in class. This process of creating and “constructing” is an essential factor in early childhood learning. Sharing projects with the class provides an opportunity for repetition to set patterning. As parents, teacher, and children share in the music making – a strong bond is made that will last a lifetime.